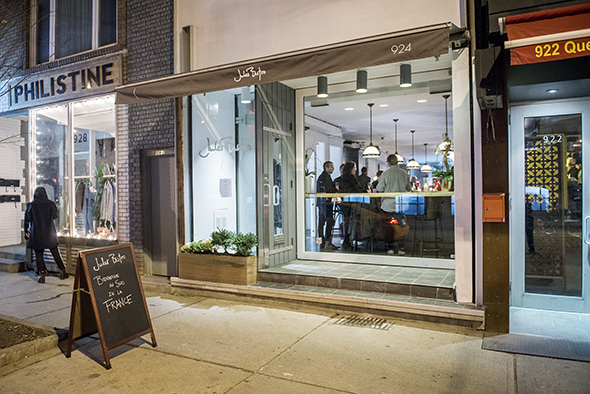 Jules Bistro has a location on Spadina , and this newer one near Queen and Shaw. The exterior and inner decor of this place are almost too understated, but the reputation of owners Eric Strippoli and David Piltz precede them. 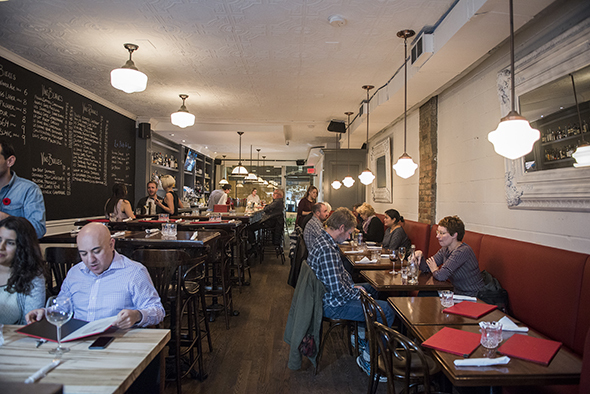 You can walk into this French restaurant feeling isolated from the big city, and walk out feeling like you've been at a family friend's place. Chef Strippoli moved here from Lyon many years ago, where he had operated restaurants before. The style here is all straight-up French, no doubt gleaned from those many years. 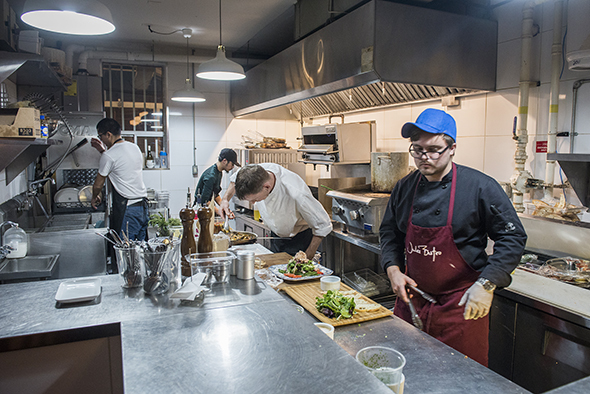 Jules is the name of his son, and Strippoli's own profile adorns the front of luxe menus. 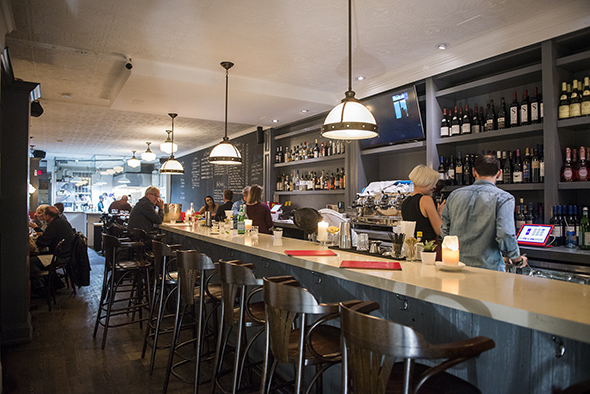 Jules Bistro also offers popular brunch and a $28.95 three-course prix fixe menu. The front of the restaurant is all glass with some bar seating facing out to the street. At first there's a long, elegant stone bar perfect for gathering with friends just for drinks or waiting eagerly for a table with your group, even a large one. The June 1974 ($16) is based off a French 75, but replacing it with a regular customer's name and birth year. 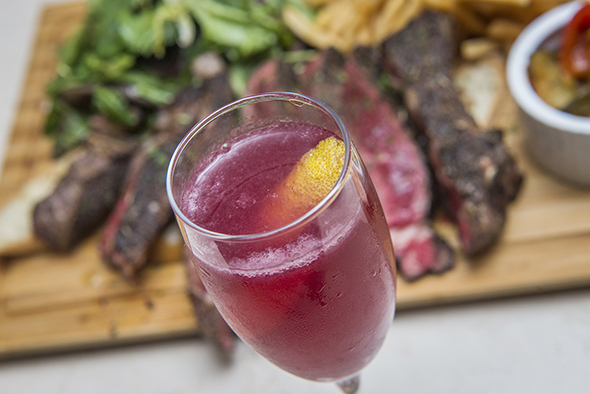 Thus, it's gin-based, made with Dillon's, adding cassis, lemon, and topping it off with brut sparkling wine. It's sophisticated with a fruity, refreshing start and a more bitter, licorice finish. 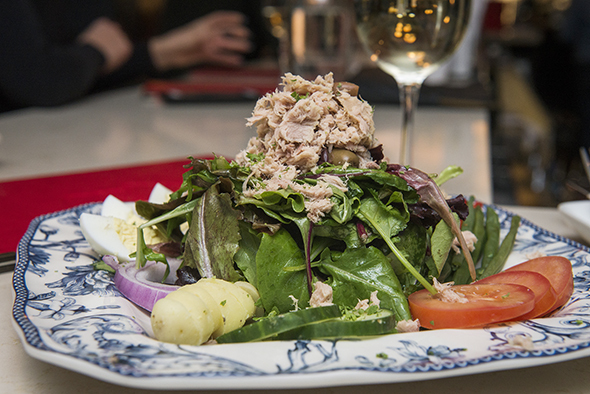 The salad Nicoise ($15.95) is of course the classic French starter, and there's nothing out of place in this one. Greens are lovingly encircled by beautifully presented potatoes, hard boiled egg, black olives, cucumber, tomato and red onion slices, and topped with a heap of canned tuna. Tonight we try the sea bream on special ($32.95), and it seems like a good indicator of typical specials and doesn't stray far from the rest of the menu. It's been seared with tomato, lemon and rosemary inside, which infuses it with a light citrus flavour, with the bone in making it very moist. For fun Strippoli filets it in front of me, pulling segments of fish off bone effortlessly. 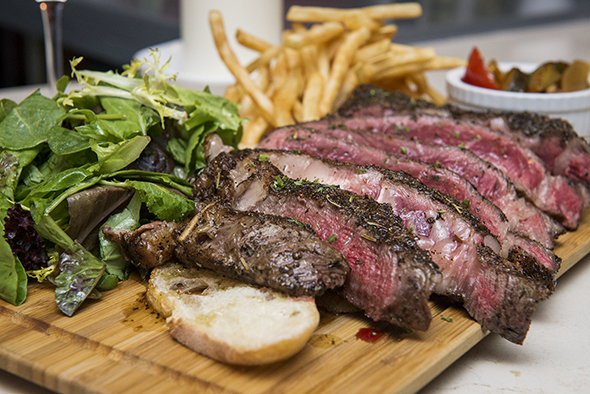 The cote de boeuf is one of Jules Bistro's reputable plates for two, a 24-ounce Angus ribeye classically prepared with salt and herbes de Provence for $64. I think you could also bring in a couple more people to make this a lighter meal with even better value. 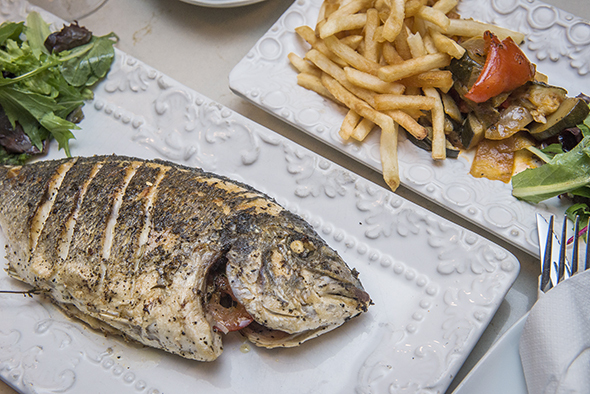 All mains (like the fish special) are served with thin crunchy frites, mixed greens, and savoury traditional ratatouille. You can see all the way to the back of the restaurant with its open kitchen. There's table seating filling this area, and a chalkboard wall off to one side where guests can look for daily specials like French seafood dishes and cocktails.